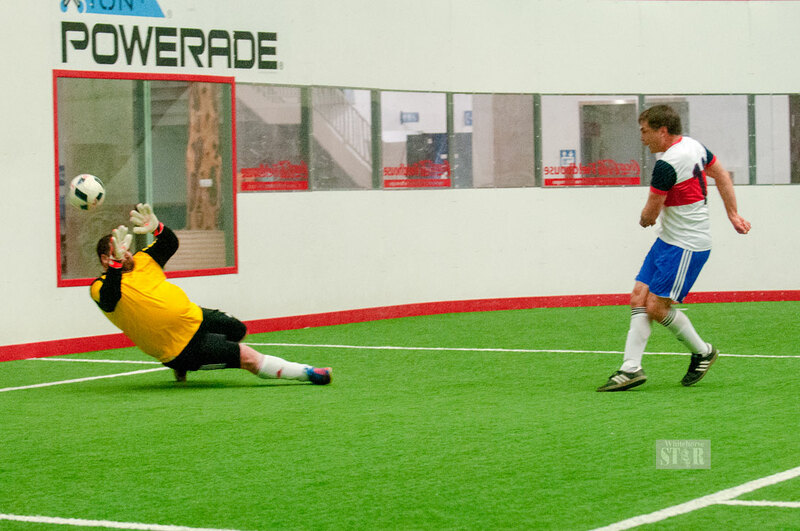 BEATING THE KEEPER – Driving Force forward Ben Mercier scores his team's third goal against the Pepsi keeper in the Over 35 Soccer four/five playoff matchup Monday at the Canada Games Centre. Yukon Brewing may have taken the league title but they hit the ground with a bump on Saturday, when Yukon Info overwhelmed them in a 5-2 win in over 35’s soccer. In what was a very flat performance by the champions, they will be concerned with their form going into Saturday’s playoffs. Yukon Info looked bright throughout the game. Oscar Rodrigues had a very impressive game, controlling the midfield and helping himself to two very nice goals. Sub Jürgen Korn picked up two, and there was the usual tap-in for the undoubtable Jim Brown. Eric Murphy and Keith Maguire got The Brews goals but they will have to play better if they still want to dream about the fabled double of league and playoff winners. Arnold Hedstrom is a well-liked and respected youth coach, but he showed on Saturday that the old dog still has a few more tricks up his sleeve, when he scored the decisive goal to lead his team, Klondike Business Solutions, to a 2-0 win over basement team Driving Force. The game was very hard-fought, with no quarter asked and none received. Driving Force did have the chance to open the scoring, but Ciaran Connelly muffed his lines and somehow missed an open goal. The game was close even after Andy Todd got the first for KBS, with both teams having chances to score, but Hedstrom circled the opposition area like a Great White Shark smelling blood in the water. He made his move after Iain Breckenridge passed the ball to him, delicately diverting the ball into the corner of the net. The win secured the runner-up position for KBS, leaving Driving Force to contemplate the 4th/5th playoff game. Known locally as the Jim Brown playoff game, Driving Force and Pepsi faced off for the right to play Yukon Brewing in the semifinals of the playoffs. It all started well for Pepsi as the Nova Scotian Messi Gord Barker drilled the ball into the net early on, but this only seemed to inspire Driving Force on, as they hit three goals in five minutes. The first goal by Ciaran Connelly was a beauty, set up by a delightful ball from Myles Dolphin for Connelly to place the ball into the net. Then it was Dolphin’s turn to get in on the act when he hit the second. This was followed up by a spectacular curling effort from Ben Mercier. Pepsi was thankful for Thomas Riexinger, who brought his city bus with him to thwart successive Driving Force attacks. The crowd counted seven excellent saves but his heroics where not enough. Even when golden boot star play Danny Macdonald did score, there was no time left on the clock, and Driving Force deservedly won the game 3-2. Semifinal games start at the early time of 8:30 when Yukon Info.com take on KBS, then Champions Yukon Brewing will try to overcome underdogs Driving Force. Gee these guys sound like Old Timers. They better take it easy to avoid injury or worse yet - stroke. Enjoyed the story.